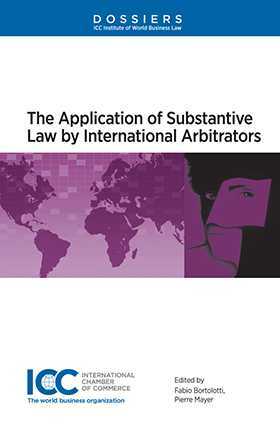 The Application of Substantive Law by International Arbitrators examines issues which may arise when international arbitrators apply the rules of a national legal system. How should the contents of the applicable law be proved by the parties? Are arbitrators bound by judicial precedents established by the courts of the country the law of which applies? How should arbitrators deal with possible contradictions between the applicable law and the clauses agreed by the parties in their contract? The right balance between these conflicting needs can only be found on a case-to-case basis, taking into account all the relevant circumstances. Dossier XI of the ICC Institute of World Business Law will give you a thorough picture of the practical issues raised when there is contradiction between the applicable law and the needs of international business.